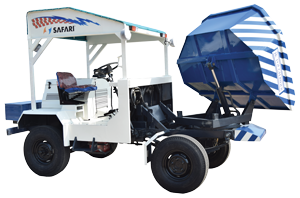 JK Tough Riders manufactured by SAFARI are heavy duty, four wheel drive site dumpers. 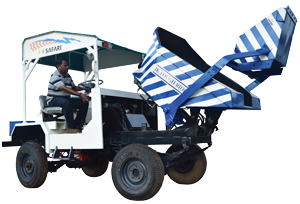 It’s specially designed 4 X 4 Wheel drive enables it to work in tough terrains to carry concrete and other building materials like sand and bricks. Smart Counter Weight System balances the Tough Rider when the driver unloads material exactly where required using the front end tipper. Tough Rider is a cost effective way of transporting building material & concrete on construction sites due to its affordable prices. Prime Mover Twin Cylinder 25 HP water cooled diesel engine with Electric Start. Transmission/Gear Box Heavy duty Oil filled Gear Box with 4 forward and 1 reverse speed. Automobile Type. Clutch Heavy duty friction type single disc. Chassis Heavy duty & sturdy M.S. Channel Chassis for longer life. Tough Rider is loaded with concrete discharged from Reversible Drum Mixer and then is transported to required location on construction site. 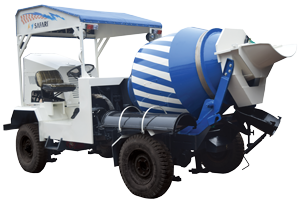 When concrete production is done at a central location on site, Tough Rider is used to conveniently transport concrete. 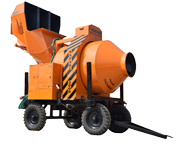 Here in this video you can see how easily concrete can be unloaded to the tower hoist bucket from the tough rider. A simple trick of placing a chute to connect the mouth of tough rider with the tower hoist bucket can smoothly transfer the concrete to tower hoist.